These American made pens are incredibly versatile, permanent on nearly all porous surfaces, non-toxic, smear, fade, and water resistant - if you feel the need they can be heat set by simply tossing your decorated clothing item in the dryer. Sharpies are sold in over 20 countries and, come on, astronauts aboard the International Space Station called Sharpie their writing utensil of choice because of their reliability in zero-gravity. How cool is that! 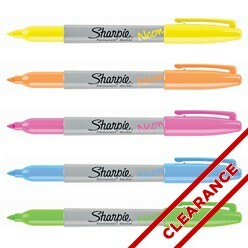 Well, Sharpie has gone and done something even cooler. Neon colors that fluoresce under black light. 80's party anyone? With five totally rad colors you can spazz your bodacious buds out with the wicked-creative leg warmers you just did up with the help of who? Sharpie to the rescue! Whoa... Righteous! The only downer at this awsome party is that they don't fluoresce much or show very well on black fabrics, but that shouldn't stop you. Blended well with like cool colors. Would like to have had this in the large chisel point.